Kastar cylinder leakage tester with 2 gauges - 100 PSI measures the ability of an engine cylinder to hold compressed air using shop air pressure and supplements a compression tester. The Kastar cylinder leakage tester has a precision regulator, an M14 standard reach adapter on a 26'' hose assembly and an M14 long reach solid adapter. The The Kastar cylinder leakage tester features a 2-1/2'' special gauge has one multicolored band for measuring low, moderate and high leakage, and a scale range from 0-100%. The second gauge is 2-1/2'' and has a dual scale dial PSI and bar, which allows the technician to monitor input air-line pressure. Kastar M10-1.00 Male X M14-1.25 female solid adapter. For testing compression on small engines such as: snowmobiles, motorcycles, outboard motors and more. Use with any compression tester with a 14mm fitting. Kastar M12-1.25 Male X M14-1.25 female solid adapter. For testing compression on small engines such as: snowmobiles, motorcycles, outboard motors and more. Kastar mini gas engine adapter - 14mm X 18mm. For small displacement engines such as jet skis, string trimmers, small motorcycles, chain saws and more. Kastar compression adapter. Combination compression adapter to be used on cylinder heads with M14 and M18 threads. Kastar M14 compression adapter extension. Combination compression adapter to be used on cylinder heads with M14 and M18 threads. Kastar M12 and M16 (9/16'') compression adapter - 2V Ford. For testing compression on 2V Ford Triton engines with 12mm and 16mm threads. Kastar cylinder leakage tester with 2 gauges - 100 PSI. This tester measures the ability of an engine cylinder to hold compressed air using shop air pressure and supplements a compression tester. Kastar cylinder leakage tester with 2 gauges - 35 PSI. This tester measures the ability of an engine cylinder to hold compressed air using shop air pressure and supplements a compression tester. Kastar whistle for cylinder leakage tester. Whistles on compression stroke and stops whistling at top dead center. Quick coupler connects directly to the cylinder hose on CLT-2 and CLT-4 as well as 74498 diesel adapter. Kastar whistle generic. Whistles on the compression stroke and stops whistling at approximately Top Dead Center. Whistle is attached to hose with 14mm and 18mm spark plug threads. Kastar Jiffee compression tester with gauge boot. The 2-1/4'' gauge has a dual scale dial with ranges from 0-300 psi and 0-21 bar. Kastar air hold fitting set. Used to apply air pressure to keep valve closed wheel replacing seal/spring. Includes 14mm and 18mm adaptors threaded for 1/4''NPT. Kastar Jiffee compression tester. 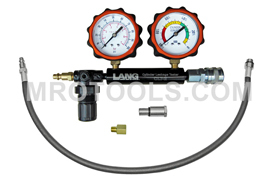 The 2-1/4'' gauge has a dual scale dial with ranges from 0-300 psi and 0-21 bar. Kastar small engine compression tester. Will test all small engines with M14 or M18 threads. Valve core at bottom ensures accurate readings. The 1-1/2'' gauge has a dual scale dial with ranges from 0-200 PSI and 0-14 bar. Kastar universal compression tester. Tests compression on domestic and foreign cars and trucks with gasoline engines. Adapters included: 14mm; 18mm short solid adapter, 14mm; 18mm long flex adapter, and 14mm long reach adapter. Kastar compression tester set. Tests compression on all domestic and foreign cars and light trucks with gasoline engines, including mini engines. Kastar ''hands free'' motorcycle compression tester. Metal clip can be attached to the gauge; the gauge can then be clipped to the frame, or handle bars allowing hands free testing. Kastar flex drive compression tester. Tests domestic and foreign cars and trucks with gasoline engines. 14mm and 18mm adapter attached to end of 12'' hose. Kastar quick compression tester. This handy tester is ideal on cars with easy accessibility to cylinders. For domestic and imported cars and trucks with gasoline engines. 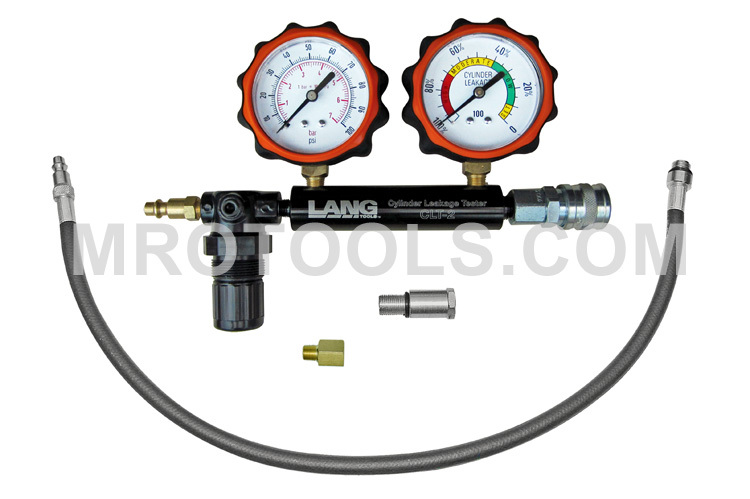 The CLT-2 Kastar Cylinder Leakage Tester With 2 Gauges - 100 Psi is one of thousands of quality tooling products available from MRO Tools. Please browse Kastar Gas - Petrol Compression Testing Equipment for tools similar to the CLT-2 Kastar Cylinder Leakage Tester With 2 Gauges - 100 Psi. CLT-2 Kastar Cylinder Leakage Tester With 2 Gauges - 100 Psi description summary: Kastar cylinder leakage tester with 2 gauges - 100 PSI. This tester measures the ability of an engine cylinder to hold compressed air using shop air pressure and supplements a compression tester. Quantity discounts may be available for the CLT-2 Kastar Cylinder Leakage Tester With 2 Gauges - 100 Psi. Please contact MRO Tools for details.